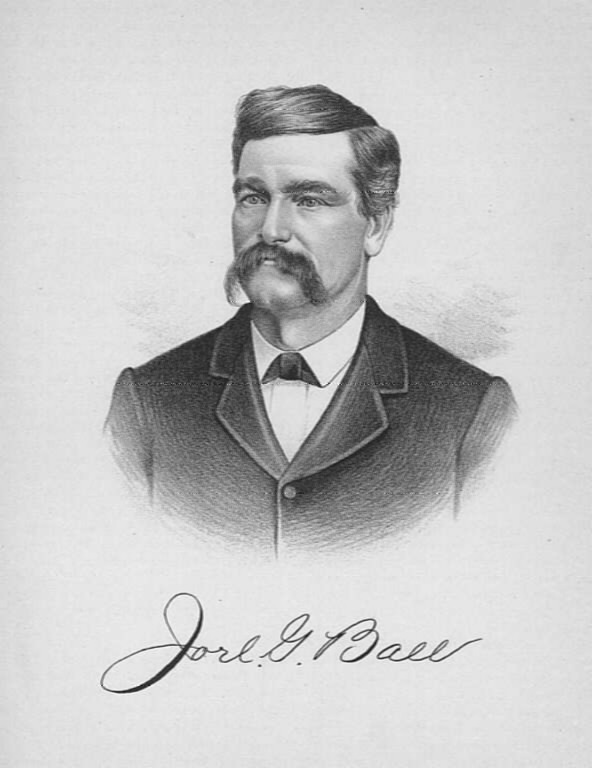 Joel G. Ball is a native of Jo Daviess County, born in Elizabeth Township June 17, 1840, the son of a well-known pioneer family of Illinois. He has for several years been closely identified with the highest interests of Stockton Township, and has been one of its leading prominent officials, holding its most important offices. He is a skillful, wide-awake farmer, and owns a good farm on section 21, comprising 120 acres of land of unsurpassed fertility. John Ball, the father of our subject, was a native of Kentucky, and a son of William Ball. He was a pioneer of Sangamon County, coming to that part of Illinois from Kentucky, in the early days of its settlement, and Ball Township was named in honor of him and his six sons. He was a veteran of the Black Hawk War. His wife, mother of our subject, was Eliza Y. Long, a daughter of Griffin Long, and she was born in Eddyville, Ky., and when a young girl, came to Illinois with her parents, who were pioneers of Sangamon County. To her and her husband were born eleven children, seven of whom are living: Adaline (Mrs. Isbell), Araminta (Mrs. Isbell), Melvilla (Mrs. Morrow), and Jennie. The father became a pioneer of Jo Daviess County, settling in Elizabeth Township, and at his death, May 23,1874, at the age of sixty-two years, his community lost an invaluable citizen-one who had done his share in promoting the growth of the county. The mother of our subject, now in her eightieth year, is living in a house near that of our subject, with her daughter Jennie. present farm in 1861, and has since made his home in Stockton Township. He enlisted from here to take part in the late war, and he is a fine type of the noble citizen-soldiers who fought in defense of the Stars and Stripes, and his family may well be proud of his fine military record. He enlisted as a private in Company F, 17th Illinois Cavalry, and was in the service two years, leaving home Dec. 28, 1863, and returning Dec. 28, 1865, with the rank of Second-Lieutenant. His company was first ordered to Jefferson Barracks, and from there to Alton, ill., to guard prisoners for a time. He engaged in the battle of Allen Station with the bushwhackers; and fought Bill Anderson near Rockport, where the rebel leader had three men to one of our subject's command, but the latter routed them. Mr. Ball took part in a skirmish near Raleigh and near Jefferson City his regiment was attacked by Price's whole force, but fell back and fortified itself in the city, and the men subsequently followed Price in his noted retreat, engaging in many bloody skirmishes on the way, and routing the enemy on each occasion. October 25, on the march, they overtook the force of rebels, and captured Gens. Marmaduke and Cable, with their commands, arms, ammunition, etc., our subject's regiment leading the charge that made the capture. October 27, at Drywood, Price made another stand, and the division in which our gallant Lieutenant belonged captured or killed 400 Confederates. On the 28th of October, Price made another stand, and lost 400 dead and wounded, and 1,000 of his men were taken prisoners. After that our subject returned with his force to Raliegh (sic), having been in the saddle fifty-nine days, riding over 1,200 miles. January 28, 1865, our subject and the men of his command were ordered to Patterson, Mo., where they assisted in building a block-house, and then started to meet the rebel Gen. Thompson, who surrendered to them May 5, 1865, at Chalk Bluff, Ark., 9,000 men laying down their arms, together with six cannon and all the munitions of war. May 11, Lieut. Ball started for Pappenville, Mo., arriving there June 1, and thence proceeded to Ft. Leavenworth, Kan., reaching that point June 14. In September he was sent with his regiment out on the plains to meet the Indians, and they made their headquarters at Ft. Larnard. After their return from that expedition our subject was honorably discharged at Ft. Leavenworth, Dec. 18, 1865, receiving his final discharge-papers in Springfield, Ill., where he was paid off. During his whole term of service, although he was often in the heat of battle, he was never wounded, and his gallantry in action and efficiency as a soldier received merited commendation from his superiors, and due recognition in the form of promotion from the ranks. The marriage of Mr. Ball with Miss Nancy Wilson took place March 31, 1861. She was born Sept. 16, 1842, in Wisconsin, and was a daughter of Jesse and Sarah (Core) Wilson. Her death, Dec. 20, 1880, was a sad bereavement to her family and numerous friends. Of that marriage six children were born, three of whom are living, Araminta, Jesse, and John. Araminta married J. B. Johnson, of this township, and they have two children, Ida A. and Emma. To his present wife, whose maiden name was Lucy Pimperton, our subject was united in marriage Aug. 29, 1883. She presides over his present home with true grace and hospitality. Two children have been born to them, Amanda and Melvilla. Mr. Ball began life in poverty; but by the quiet force of persistent and unwearied labor, backed by sound sense and excellent judgment, he has accumulated a comfortable property. He is a man in whom his fellow-citizens justly have great faith, and they have repeatedly called him to responsible offices, and he has never betrayed their trust, but has worked zealously for the common good. He is at present Assessor of the township, having been an incumbent of this office two years, and he has also been a Township Collector in the past for five years, and Deputy Sheriff six years. He is identified with the Masonic fraternity at Morseville, being a member of Plum River Lodge No. 554.